It is very easy to travel to BLS English which is located in the historic town of Bury St Edmunds in the county of Suffolk. 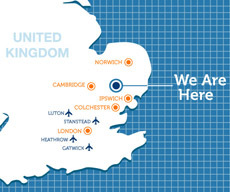 Cambridge, Newmarket, Ipswich and Norwich are very easy to reach from Bury St Edmunds and London Stansted Airport is only 45 minutes away. Heathrow and Gatwick airports are a 90-minute journey by taxi transfer. London City and London Luton airports are approximately 75 minutes. 90 minutes from Heathrow and Gatwick.